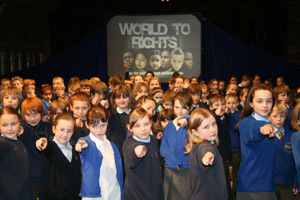 The World to Rights day is made up of educational workshops and a performance. Starting with a basic knowledge of Rights, the children explore how Victorian times was the battlegound to child rights in this country and paved the way for our appreciation of protection, healthcare, safety, a loving family and an education today. The workshops include: life in the cotton mill, life on the streets of London and a ragged school, and finally life in a Victorian circus. Various scenes portraying children’s lack of rights 150 years ago help the participating pupils to gain a sense of privilege and responsibility to others around the world today who still have no rights. Janet Hoyte – Croft Primary School, Gloucester.